One evening I was explaining to my eldest son, the story behind the tales of the "1001 Nights". How a princess sat with her king for 1001 nights, telling him a story a night, to save herself from being killed. He enjoyed those stories and I thought I would introduce him to a short story by Borges, who uses the concept of the story embedded into a story in his writings. In Borges' short story, a reader is sitting in an armchair perusing a book about a reader who is himself reading a book when he gets stabbed by an intruder. 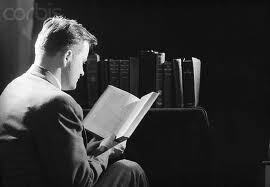 This first reader in the Borges story instinctually looks behind his shoulder to ascertain his own safety. I, the reader of Borges also couldn't help doing the same. It was a reflex created by Borges. Curious, my son asked what happened to the reader. 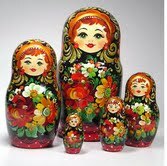 I couldn't recall the ending of that short story, but its development into an embedded story has been safeguarded in my memory from my "Latin American" major days, in the same way as my memory of playing with Russian dolls. You open one and another one presents itself, ready to be opened for another one and yet another one. Like Sheherazade, who presented tale upon tale for so many nights. When this same son had an art project two years ago to create a self portrait of himself, we thought of a photograph, embedded in another one, and yet again in a larger one. 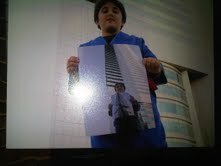 We went to Emirates Towers, where I snapped a photo of him wearing his blue judo kimono and his then orange belt. We rushed to develop it. 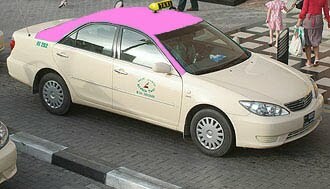 We then went back to Emirates Towers. He held that photograph, wearing the same costume and I took a second photo. We repeated the same process again and again. It was the easiest way for me to explain the intricacy of the embedded narratives in 1001 Nights. A little more simple than Borges! 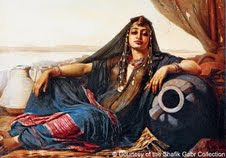 Why did Shehrezade prolong her life for 2 years,9 months and 4 days only?That will always be her secret in keeping the interest of her king going.Usually people of power have a very short concentration capacity.My own family laugh at my attention span,not that I have power or ability to listen to long winded stories. Canada,I have a doll just that one in picture . Mine comes apart in eighteen pieces. I don't know who to ask about the story behind the art?